As a parent, one of the incredible mysteries has been to watch each of my children come into this world with a predetermined personality. Our parenting style seems to have little effect on these inborn traits. We know that our ultimate personality is a grand mix of what we come into the world with, our genes, and the life experiences we have. One such nuanced trait that is both nature and nurture based is the optimism/pessimism scale. You can surely place yourself on this scale as you read this. Maybe you’ve been called an idealist, or negative or someone who always looks on the bright side. It’s important to realize that both optimism and pessimism have pluses and minuses, especially with end of life issues. These traits in general are things that help us manage our expectations of the future. An optimist will assume a positive result, while a pessimist expects the negative. The way we tint our vision of events, whether rose or blue tinted, is also a way to manage our emotions related to these events. Optimism acts to buffer anxiety and can raise us up and out of a gloomy reality. Pessimism also protects our emotions. By expecting the worst, we insulate ourselves from disappointment and create a possibility for a pleasant surprise if things turn out better. One way to consider the optimism/pessimism concept is to consider it as a fluid scale. 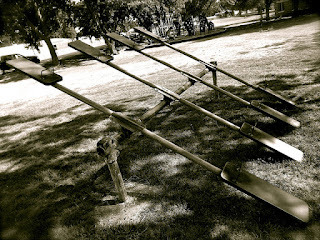 We slide toward one side or the other depending on if we are thinking about work, relationships, world events, etc. 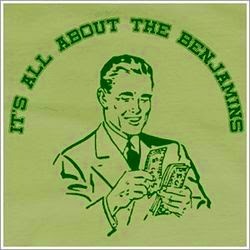 Alternatively, we may consider ourselves realists, always right in the middle, finding a good mix of hoping for the best, while still preparing for a worst-case scenario. Knowing that these traits are inherently protective, it’s no surprise that with end of life issues I often encounter the extremes. Moreover, what I notice is like most things in life, it’s at the far extremes that these traits move from being healthy to unhealthy. I’m all for thinking positive, but when Mrs. W was confronted with her new cancer diagnosis and refused to start treatment because it was “surely a mistake, I most definitely do not have cancer” her extreme optimism is now be labeled denial. While denial will certainly protect ones emotional well-being, it does little to protect the physical reality of disease. Mrs. W’s case is extreme, but there are more subtle ways that extreme optimism causes harm. Unfortunately, it is quite common for people on hospice to put off important conversations, financial decisions, and delay dealing with things they should because their optimism clouds the reality of how serious their condition is or how much little time they have left. On the other end is extreme pessimism. Mr. H refused starting a therapy that would add both years and quality to his life because “What’s the point! Now that I have cancer, I’m done trying to live!” We sometimes label extreme forms of pessimism as depression. When someone is paralyzed with inaction because of their negative attitude, it may protect them from being disappointed but does nothing to improve reality. It’s nearly impossible to move someone from the extremes at the end of life. Understanding that a lifetime of personality is at play may at least garnish some compassion. Last year, the Institute of Medicine gave us the near-simultaneous release of two reports: Graduate Medical Education That Meets the Nation’s Health Needs and Dying in America: Improving Quality and Honoring Individual Preferences Near the End of Life. These reports address two related aspects of reaching the IOM’s triple aims of better care, better health, and lower costs. 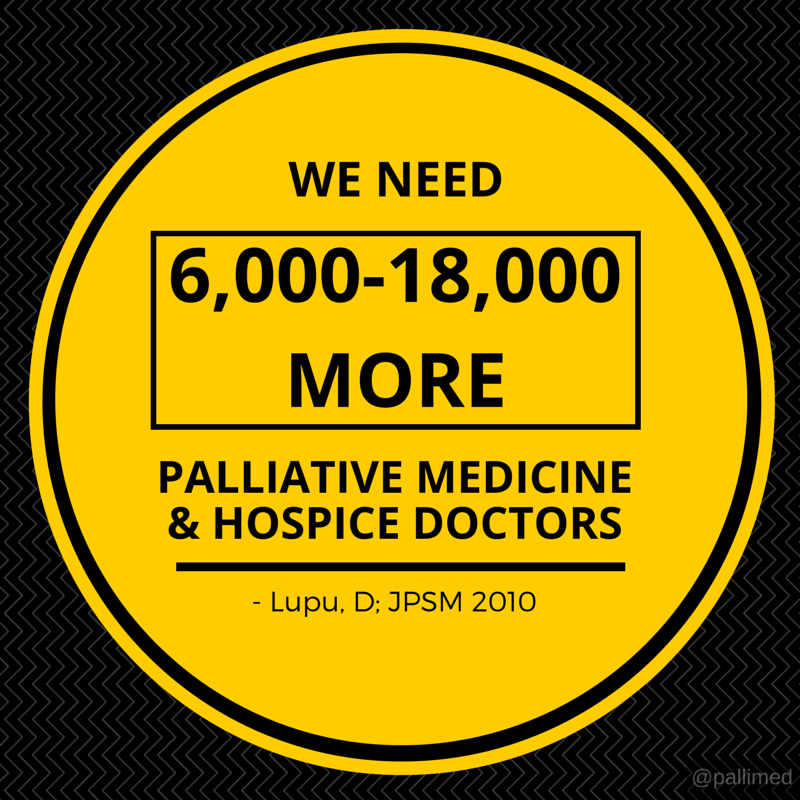 Even casual readers of this blog will know that there is a problem with the number of trained hospice and palliative medicine (HPM) physician specialists in the US – with an estimated 6,000-18,000 physician shortage in 2010 alone. According to the IOM Dying in America report, there were 6,400 physicians board-certified in HPM by ABMS between 2008 and 2012, though the practice styles of these physicians are unknown. Unfortunately, HPM is not individually monitored by HRSA National Center for Health Workforce Analysis (pdf), which monitors physician workforce. In these reports, HPM is contained in the “other patient care” category of physicians, which is one of the few projected to decrease in FTEs by 46% by 2025. It is no wonder, then, that the IOM Dying in America report highlighted the limited number of palliative specialist physicians (as well as nurses, social workers, spiritual counselors) as a major deficiency with regard to progress since the previous IOM Approaching Death report in 1997. 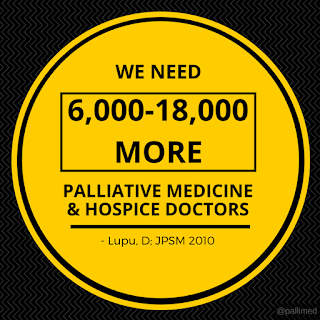 Back in 2010, the AAHPM Workforce Task Force laid out a model for physician workforce need to staff hospice and hospital-based palliative care and concluded that “the annual need for new physicians [leaving fellowship] just to keep pace would be about 269 physicians for the middle estimate and about 472 physicians for the high estimate. More will be needed to prepare for growth and aging of the population. Training capacity thus needs to expand considerably.” Since that time, we have seen disruptive changes in the financing of health care, robust growth in community-based palliative care and the closure of one of the country’s largest HPM training programs. “Encourage production of a physician work¬force better prepared to work in, help lead, and continually improve an evolving health care delivery system that can provide better individual care, better population health, and lower cost. Provide transparency and accountability of GME programs, with respect to the stewardship of public funding and the achievement of GME goals. Clarify and strengthen public policy planning and oversight of GME with respect to the use of public funds and the achievement of goals for the investment of those funds. Ensure rational, efficient, and effective use of public funds for GME in order to maximize the value of this public investment. In August 2013, "Improving Value in Graduate Medical Education" from the the Council on Graduate Medical Education emphasized that “Increases in GME funding should prioritize training programs that have a particular emphasis on new competencies needed to meet the changing health care system…to accelerate physician workforce alignment with population and health delivery needs.” They ask that particular attention be paid to specialties which prioritize “1) training in a variety of community settings, 2) treating diverse populations, and 3) emphasizing team-based care, care coordination, telemedicine, and efficient care provision.” Unfortunately, following this description of some of the key aims of HPM, they proceeded to omit HPM from their “high priority” specialty list. Revisit and expand the concept of the “academic hospice” in the context of a push for community-based GME? Develop another HPM workforce study given the drastic changes in the field since 2010? Partner with other organizations to create a comprehensive workforce strategy for interdisciplinary, specialty palliative care & hospice? Attitudes, values, and beliefs are bound to shift when people become ill, especially when active treatment for acute illness shifts to palliative care. 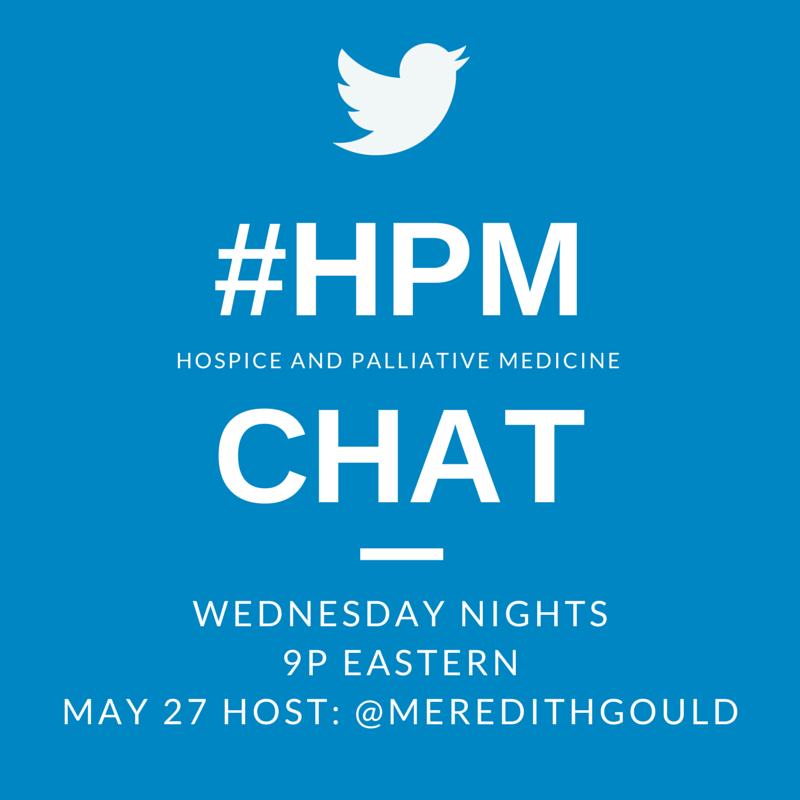 During tonight’s #HPM chat, guest moderator @meredithgould will focus our conversation on shifting attitudes, values, and beliefs about health and spirituality (not religion!) for patients, caregivers, and providers as well. Meredith Gould, creator of the #chsocm (church social media) hashtag and #chsocm chat founder, recently created #hlthsp to tag content and conversation about health and spirituality. She and Regina Heater (@reckshow) anticipate launching that a monthly Health and Spirituality chat #hlthsp this summer. 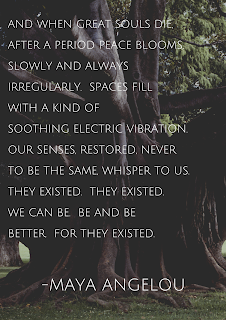 Check out more Pallimed posts on Spirtuality and Religion here. So many wonderful things have happened during my 15 years helping develop and lead so many of our palliative care programs throughout Johns Hopkins Medicine. As a big highlight, I was asked to be the staff speaker at our Cancer Center's recent annual memorial service. It was such a moving experience, with our lobby full of 300 family members and many staff who spent countless hours putting this together, and a lot of love. The most amazing part was the mother of a patient we had who died at a young age after her transplant, that we all felt so badly about, who told us she came especially to thank us for making sure she was comfortable. Inspired by Alex Smith's sharing of his memorial service remarks on GeriPal last year, I share here some of what I said. The services are posted on our website if you want to see what it is like as a model for your own program. Everyone told me to speak from my heart, and to make this personal, so that is what I will try to do. I am so honored to be asked to speak to you tonight. I am here as the physician with our pain and palliative care program now for many, many years. I am also here as the daughter of Lester Morss, who was a patient here for a very brief time. My mom and my dad’s sister are here with me to honor him and all of you. A year ago today, my father, who was an avid photographer, was taking his last pictures – at my daughter’s bat mitzvah rehearsal. Eleven months ago today, he died at home, with all his family around him, just a few hours after telling everyone goodbye. And I am here representing my amazing transdisciplinary team who has worked for so many years to improve living with cancer here, and so many who have supported us, and all the staff here. Mostly, I am here to thank you all for sharing your loved ones with us and allowing us into this most precious and intimate part of living: caring for your loved ones at this most difficult time in your lives. We thank you especially for what you have taught us: we have learned so much from you that allowed us to take the best possible care of our family members when this happened to them. So I thank you all, for lending us your loved ones for a time, for helping me to help my father and my family, because although there are no right answers, at least I had a path in front of me to follow, paved by my learning from you. An example set by you of compassion; of caring; of amazing strength; of the power of love; of how to survive the most challenging of circumstances; of honoring those that you have lost; of being a better person every day, because they lived. They lived. And we remember, we remember them. We remember them with you today. And for every patient I see, I try to take that extra moment, to bring in something that you have taught me. I thank you for that as well: for everything that you have done to make us a better physician, a better nurse, a better social worker, a better chaplain. A better daughter, a better mother. We are part of your legacy. We know the physician is the least important part of the team – and the most important part is you, the family and friends. What matters is not the types of treatments we gave you, but the legacy and love that you shared and that is still here– that they are still with us. Caring for someone with cancer is so hard. Cancer is suffering and losing everything and chaos and trying to make it through another day. The terrible things i did – being short with my loved ones despite my best intentions – and the wonderful things you did – forgiving, kindness to each other, talking about things we never talk about, together. 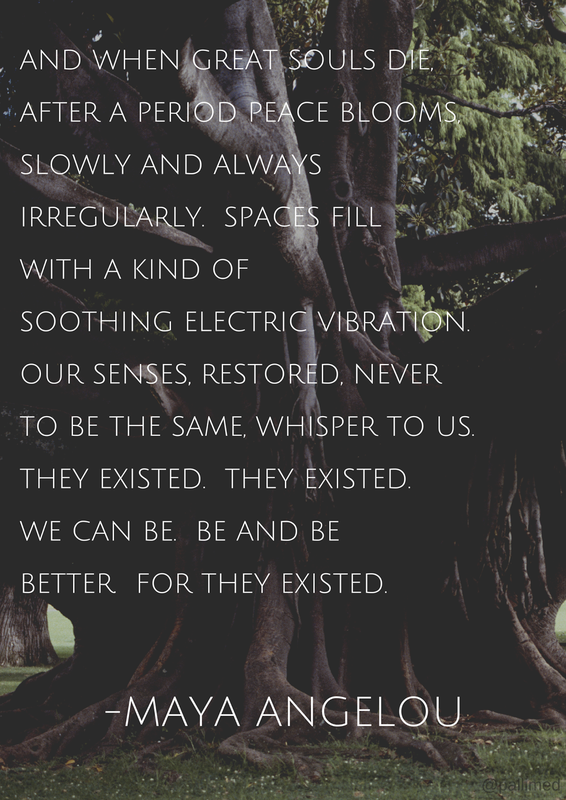 And grieving is so hard - grieving is wishing that things had been different and thankfulness for what we had and forgetting the things we so desperately don’t want to forget. And as my daughter wrote: wishing for just one more day. We thank you for allowing us into the most sacred and intimate moments of your lives – to see the very essence of your souls, the amazing love and caring and the incredible things you have done, what you and your loved ones were able to accomplish despite such tremendous suffering. We thank you for teaching us so much, for teaching us what will allow us to take better care of all the future cancer patients who walk through our doors. We thank you for all the incredible work that you did that makes our work possible. I know how little what we do helps – but I hope it does help, even a little. Of all the things I’m working on personally this year, the most important has been forgiveness. This has taken me such a long way: forgiving all the crazy things that happened, forgiving myself, for the things I wish I had done. It has helped me so much to let these things go. And I hope you can forgive us too: for not listening as well as we should, for thinking a treatment would work when it didn’t, for not calling you back right away when I know you were waiting by the phone. I hope you can forgive us, because we tried . And I hope we can do better. A little better every day, because of you. From my heart, from all of us, I thank you for helping us heal from our own losses. For taking care of your loved ones, helping us to give back, makes it possible for us to go on. For me personally, it has been such a gift this year to work with you. I thank you for all you have taught us and helping us by coming here tonight. Sydney Dy, MD, MSc is a palliative care physician and researcher in the Departments of Health Policy and Management, Oncology and Medicine, and Duffey Pain and Palliative Care Program, Johns Hopkins. For some time, I have had an interest in the complexities of the Live Hospice Discharge. What would seem to be a happy occasion for the patient and family (going off hospice!) is often a time of unexpected stress, and the transition off hospice can be as complicated as the hospice admission. In many cases I have noted mixed feelings as the patient goes from the ranks of the “dying” to ranks of the “living”. Sometimes the patient verbalizes those mixed feelings with statements like, “I guess I’m I not dying fast enough!” One family was heard to report discharge from hospice felt like a “divorce”. I began to wonder if the difficulty I saw with a fair number of hospice discharges was a random occurrence, something related to a specific patient population or something more universal. To get a better understanding of the Live Hospice Discharge I searched for articles that might provide some insight. I was finding very little written about the emotional aspects of the Live Hospice Discharge until recently finding an published article (5) discussing this topic, authored by Assistant Professor Rebeka Watson Campbell at the University of Texas Medical Branch at Galveston School of Nursing. This study chronicled the experiences of patients and families discharged alive from hospice programs in Texas. From the interviews, there were a number of recurring themes of unexpected suffering discovered among the hospice “graduates”, their families and their caregivers. 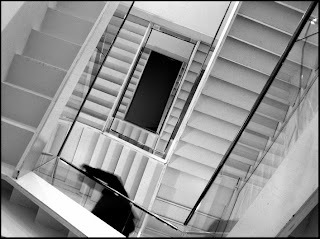 The themes of suffering included: abandonment, unanswered questions, loss of security, loneliness, uncertainty, anger and frustration, anticipation of future physical decline, and the ongoing strain on the family and caregivers that are bearing seemingly endless witness to their loved one’s slow dying process. Based on the depth of suffering reported with Live Discharges, it would seem important to start planning early on for a possible later discharge, especially when the patient has a non-cancer diagnosis with potential for improvement. It could be beneficial in some cases to briefly discuss the potential for a later discharge as early as the first visit. The subject could then be brought up gently at future visits when appropriate. These discussions might help prevent the shock that often occurs when the discharge topic arises late in the course of care. With all discharge discussions during the course of care, keeping a positive spin on the discharge would seem important, always making it clear that the hospice program has an open- door policy should re-admission be needed. Keeping too positive a spin on a discharge might encourage false hope of a recovery, though. Going off hospice could be presented as just one possible outcome when presenting the best, the worst and the most likely scenarios. Some patients and families can show an excessive dependence on hospice early on and could be candidates for a difficult discharge down the road. Fostering independence, important with all hospice patients, would appear even more important with this population. The time to document the discharge plans in the patient’s record would be after that shared decision is made. Prior to this time, the record should only indicate that the policy for discharge was discussed. Once the record mentions and demonstrates that the patient is no longer hospice appropriate, then, a date for discharge should be set, the plans outlined in the chart notes and the discharge program set into motion. The discharge plan needs to be clearly understood by the patient, the family and the entire hospice team. There should be assurance that on discharge there will be reliable caregiving. 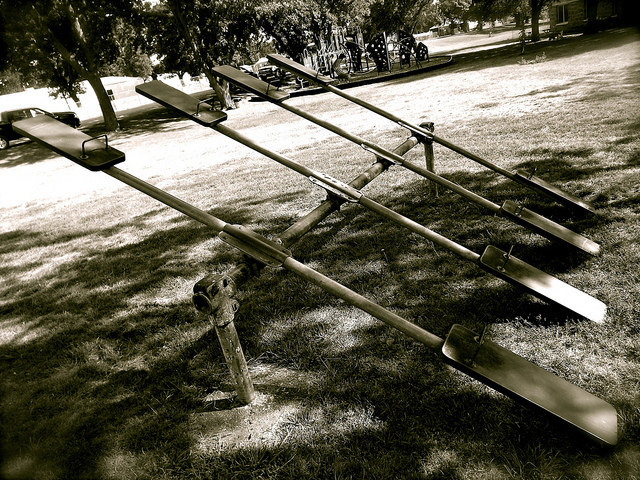 Transition of any needed durable medical supplies to a new DME provider should be timely. An adequate supply of listed medications should be provided. There should be arrangements for follow up with the patient’s Primary Care Provider (PCP). Often the PCP has deferred many decisions to the hospice team. Ongoing updates to the PCP while the patient is on hospice can help keep the PCP “in the loop” so when the PCP gets that call to coordinate follow up care, he or she will feel more on top of things, more likely to provide good follow up care and less likely to feel suddenly burdened with their patient. A visit by the hospice doctor prior to discharge can reinforce the plan for post-hospice follow up and ongoing care. This could also be a time to explore any unanswered questions. It is also an opportunity to clearly outline the indications for hospice reenrollment. On discharge, following through with phone contact is essential. Routine phone follow up from the patient’s Case Manager, Social Worker, Aide or other staff member should help dispel some of the loneliness, frustration and uncertainty. Continuing some volunteer services can provide an additional level of contact. The article by Dr. Watson Campbell is eye-opening and promotes a better understanding of the effects of the Live Discharge. It should encourage the planning of a smooth transition plan off the hospice service, helping the interdisciplinary team, the patient and the family better handle the emotional “paradox” of the hospice discharge while getting the patient re-enrolled at the right time. Acknowledgement – Thanks to Dr. Rebekah Watson Campbell and to Hospice Social Worker Megan Crouse for their valuable input. Today I started my training for my eighth marathon, the Chicago Marathon in October 2015. I started running as a way of relieving stress during my first job as an oncology social worker at Beth Israel Hospital in Boston in 1984. Running along the Charles River was extremely therapeutic! I had no idea how emotionally challenging the work would be, and yet I absolutely loved it. My training as a clinical social worker taught me the most invaluable defense against burnout: self-awareness (aka dual- awareness or counter transference). This is the one learned skill that I have used every single day in my practice working with end of life and cancer patients. I don’t think about it anymore because it’s second nature to me, but I teach other providers about it every day. Self-awareness, learning about how our reactions impact our patients’ families and ourselves is, in my opinion, the most important thing you can learn to do as a clinician that will both improve your practice and protect you against compassion fatigue and burnout. 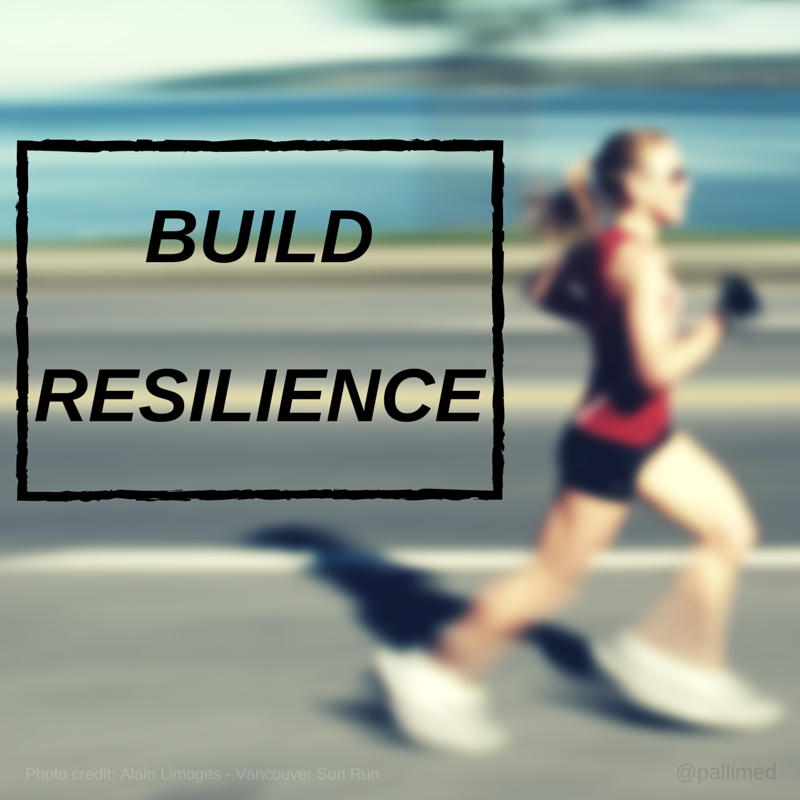 Like resilience and self-care, training for a marathon requires just a couple of things: focus on a goal, time commitment and willingness to self-examine. OK, a good pair of shoes is also required! Using that as a metaphor is how I like to think about resilience in palliative care. You could go out and run 26.2 miles, but without training you’re going to hurt yourself and may never run again. With practice, and small successes you can reach your goal and that finish line; and may have even learned something about yourself in the process. As most marathon runners will tell you, it’s about the training. When do you need water; when should you take a walk break; what is the best gear; how do you deal with hitting a wall, what are the roughest miles for you; what should eat the night before? The only answers to these questions come from training and trial and error. I think it’s the same for assessing what you need to stay resilient throughout your career – what works for you; what should you do when you start to get “crispy”, what are the signs you take a walk break; how do you reward yourself? Of course, you can run a marathon just by increasing your mileage each week and not thinking much more about it. But in my experience, your marathon will go better and will have lots more meaning if you take stock and self-examine along the route. We all know about burnout and compassion fatigue. Thankfully there have been many wonderful studies and articles about how burnout affects providers in palliative care. I’m glad so much attention is being paid to our sanity and longevity. It’s time to adopt some strategies for a lifetime so that we can continue this work, and survive, for the long haul. 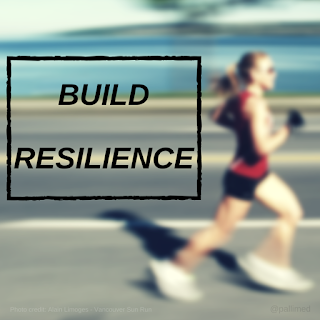 I encourage all of us to think about our commitment to resilience and self-care as a marathon, not a sprint. Developing habits and insights that can carry us through to a finish line, not just the first water stop. Take time to think about this work we do and how it impacts you and how you impact your patients and families and co-workers. This skill and knowledge will surely take you to the finish line and hopefully you won’t be last! Last year saw the resurgence of the podcast with the cross-media popularity of the show Serial, an investigative journalism podcast focused on a homicide in Baltimore from years ago. Now don't beat yourself up if you didn't hear about Serial, or you thought podcasting was something which thankfully went out of style in the late 2000's along with blogs. Believe it or not we are in the midst of a podcasting renaissance, and there are people who are producing palliative care themed shows. MyPal is a podcast about technology, innovation and research relevant to palliative and hospice care hosted by Dr Amara Nwosu MBChB, MRCP (@amaranwosu). Dr. Nwosu is a specialist trainee in the field of palliative medicine at the University of Liverpool, United Kingdom. Started at the very end of 2014, he has produced 11 shows, but has been silent the past 6 weeks, but I expect we will here more from him. The shows are about 5-15 mins long, so perfect for a car ride to work. Two Voices One Perspective End-of-Life is one of the earlier and more consistent podcasts on hospice, grief, widowhood and caregiving. Mark Dimor hosts this podcast and was inspired to become a hospice advocate after his wife Donna died. I know Mark from Twitter (@MarksPhone) where he has regularly particpated in #hpm chats. The shows are about 10-20 minutes long and he has been doing them since May 2014. Hospice of the Bluegrass podcast has been podcasting since 2012! Kudos to them for leading the way. The shows sound like they are audio recordings of lectures, so there is some good learning for clinicians to be had although it may be more difficult since slides are not part of podcasting. The Journey Podcast (aka The Journey Radio podcast) by Deanna Cochran, who started in November of 2014 and has produced the show on a weekly basis since then. The shows last 30-60mins in a long format interview with clinicians advocates and patients. Deanna is a founder of the End of Life Practitioners Collective. MVI Radio is a podcast about the business of hospice by Andrew Reed, a CPA who consults with hospices on business operations and finances. Started in 2015 he is 8 episodes in with most of the shows being around 15 minutes and a couple being hour long lecture format. Get Palliative Care (the public facing side of CAPC) just launched a new podcast in April 2015. This is aimed more towards patients and families, and seems like it will be focused on narrative. The Center to Advance Palliative Care has only put out three shows in about a year, so it is not a repeating podcast but really more of a small library of short snippets on palliative care topics. They have spent more time on their You Tube. I include it here hoping we see more shows with good production from them. John Taylor Hospice Podcast is not made by fans of Duran Duran but is a series of 3 shows from a few years back. No new shows are being produced. Hospice Foundation of America podcast is no longer active but a shot good series of podcasts that are really videos. I include it here for completeness since technically it is not an audio only podcast, but because it will frequently show up in searches. Allie: In the pediatric palliative care world there are decision-points throughout the illness course, all of which are times at which our team would be consulted, if I ran the show. 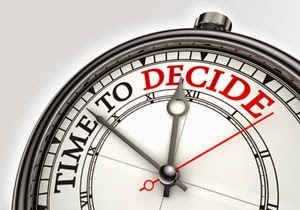 Decisions can be treatment related -- do you want a tracheostomy and g-tube for your child -- or life and death decisions such as withdrawal of no longer beneficial medical treatment, as well as a wide range of those in between. Sometimes these decisions are raised more as the plan of care than a choice point. Although it is likely not the intention of the attending or surgeon to limit the parents’ choices, the message sometimes comes across as “of course you would get the trach for your child. Without it s/he will die!” But these decisions are complex ones, colored by so much more than life and death, or even comfort and discomfort. Parents get input from their friends and families, the community, even TV, movies, and the news about “the right thing to do”. They also have to consider their faith, their own values and morals, and the most important part that those of us on the medical team often forget about or know nothing about, how their decisions fit into their own family. The single mother with 3 children who has to work to continue receiving her benefits who is now faced with a newborn coming home with a trach and vent, something which means she will get little in the way of nursing over time, might make a different decision that the couple facing this in their first child when one of them is able to stay home from work. Lizzy: In geriatric hospice care, the first decision that comes up is the choice for hospice. This is sometimes a conversation that happens over weeks. A family may initially decline hospice and then, when they see for themselves that the treatment is burdensome or not effective, then they concede to talk with the hospice admission nurse again. Upon admission, sometimes well-meaning family members tell us not to tell the patient that they are on hospice. They believe they are protecting their loved one, but when you talk to the patient, often they have an understanding of their own condition. The next decision could be to sign a DNR (Do Not Resuscitate) form if there is not already one in place. While on hospice, the acceptance of the administration of pain medicines, the decision of whether to treat infections, and even after-care (burial or cremation) can be points of disagreement for patients and families. Who’s in charge, patient or family? Allie: Unlike in the adult world, the patient does not run the show, and it is not just about the patient. The child is not the decision-maker and parents can choose to keep information from the patient, up to and including diagnosis. On the whole, this is not something that anyone in the medical field would advise the parents to do. Studies show that parents who talk to their child about his or her illness and even death feel no regret after the child dies. Although we still see parents strive to keep things from their children, especially younger children who they fear may not understand, it seems like, anecdotally, more and more parents are involving their children in discussions about their diagnoses and treatments as well as having them take an active role in decisions around their own end of life. Lizzy: The patient does not always “run the show” in geriatrics either. While we try to have the patient be the primary decision-maker as much as possible, many elders over the age of 80 have some form of cognitive decline. With elders on hospice who have a dementia diagnosis, you are working with the family as decision-makers. Hopefully there is a clear next-of-kin decision-maker or a designated health care POA. If not, then my job gets more complicated if there is dissention. Allie: We have to negotiate the fine line between advocating for the best interests of the child and the long-term best interests of the family. In conjunction with child life specialists we try to educate the parents about what other families have done with communication. Another role for us is to provide a safe, non-judgemental person to weigh their options with. Since self-determination is a core social work value, we want to be sure that parents understand that we will support their decision, no matter what it is. Lizzy: We work with the family to ensure patient autonomy whenever possible. Family members sometimes believe that a health care power of attorney allows them to override a patient. We gently have to instruct them that as long as the patient can express their own needs and goals, we are going to ask the patient first. Lizzy: I always try to circle the conversation back to, “what would [the patient] want?” Family members can get caught up in the own fears of loss and sometimes forget to put the patient wishes front and center. In an ideal world, they would have had the conversation about “wishes”, but the reality is that most families have never had in depth conversations. Allie: This works well in pediatrics too, although sometimes it is a bit more abstract because the patient is an infant or limited in how s/he communicates so the parents have to think more in terms of “what do you want for your child?” Very few parents have had the conversation with their child, regardless of age or prognosis, and I can’t say I blame them for that. Normalization and validation are important interventions in times of decisions. We strive to normalize their thought processes and validate their choices and the struggle between settling on one of two options, especially if there is no clear easy choice, such as in extremely rare conditions where the parents have to make decisions based on limited or missing information. Lizzy: There can be situations in which there are inconsistent views within the family. If we identify that our hospice team is getting mixed messages from the family, then we will set up a family meeting and try to get all the dissenting family members in the same room to have an open discussion. This can happen with or without a designated Power of Attorney. Sometimes the designated decision-maker needs or wants support from hospice team members to explain their choices to the rest of the family. Allie: Typically parents are on the same page, or close to it. Often the team sees one parent primarily in the hospital, either because the other is working or not involved. Sometimes, when we assume that parents are both considering opposite choices, an open conversation laying out all options and encouraging both parents to outline their thought processes will show that they are on the same page, or very close in their thinking. Parents who have split or divorced and now have a new partner in their lives can sometimes make for tricky dynamics also, especially if the step-parent plays an active role in the child’s life and there's tension between that person and the other parent. Again, open communication with all players involved is often the key here. In the modern world, what defines family is widely varied so we try to allow the core family, the child and parents/guardians to tell us who is in their family and how they should be involved. Hospice is better care at a cheaper price, right? Prior studies support cost savings but are critiqued for methodological problems. The most problematic is selection bias: hard to know whether cost savings are truly due to hospice enrollment or, instead, due to the patients’ underlying preference for less aggressive (and cheaper) care. Gozalo et al attempted to clear up this issue in their May 2015 NEJM paper that rigorously evaluates Medicare cost changes in nursing home patients with and without hospice. They apply a new statistical analysis, difference-in-differences cross-temporal matching design (which definitely was not covered in Statistics 101) in attempt to more accurately compare hospice and non-hospice users, without selection bias. Since this is not a statistics blog and I’m sorely unqualified to do so, I will not argue the merits of this method but will instead assume that it is valid. At the very least, it seems to better approach the goal of comparing apples to apples than previous studies. Hospice in the nursing home does not save money but instead costs an average of $6,761 more per patient. Not to be overlooked are other findings in their study showing that hospice patients had less hospitalizations, fewer feeding tubes, less ICU time and fewer burdensome transitions. Hospice use in the nursing home has significantly increased, doubling from 23% to 47% from 2000 to 2012. Most of this increase occurred due to increased enrollment of patients with non-cancer diagnoses who have longer length of stays(LOS) and harder-to-predict prognoses. In this study, LOS increased from 72 days to 93 days, in contrast to other instances of increasing short-stay enrollments. Initially, these data are surprising, and maybe even disappointing. Those of us who routinely enroll nursing home patients in hospice do so with the belief that it is the best option not only for the patient (which remains well supported by the evidence in this paper) but also for “the system”. The question now at hand is, what is the balance of patient benefit and system cost? Is hospice still the right thing even if it does not save money? At its inception, the Medicare hospice benefit was intended to provide high quality end of life care, but was also expected to save costs or be budget neutral. As appreciation for the benefits of quality end of life care grows, should cost savings remain a primary goal? When do we stop making the argument that we have to do more for less and simply argue that we need to do more? Although the triple aim of improving care experience, population health and per capita cost remains important, the balance of the three factors needs to be maintained. As Jon Keyserling states in the NHPCO response to this article, “cost savings should always be secondary to the goal of delivering high quality care”. Good care is not always the least expensive care- do you ever hear anyone touting cost savings when promoting the latest targeted cancer treatment or surgical cardiac procedure? Patients and families never choose hospice with a goal of saving money for the system. They choose hospice care because it meets their needs. It’s great that hospice and palliative care can save money in some settings, but even when it doesn’t, maybe it’s still the right thing. The population of people we are really examining is the group for whom hospice services have been “expanded”, mostly nursing home patients with dementia, without cancer. The finding that hospice may be less cost-efficient in this group could be a stimulus to develop a unique program of care for this population: one that can achieve the goals of avoiding aggressive care and addressing patients’ unique priorities, but with a model different than hospice, perhaps a less costly one. May this be a challenge for the field: Will one of you complete a study to examine which elements of hospice are beneficial to this patient population? Are there additional helpful interventions that are not part of the hospice benefit? Hospice enrollment of patients in nursing homes does not result in Medicare cost savings, due in large part to patients with non-cancer diagnoses who have long lengths of stay. But, hospice enrollment does decrease aggressive care and burdensome transitions at end of life. - Will experts weigh in on the statistical tool utilized in this study and confirm the validity of the findings? - Can we develop better measures to compare the benefits of hospice to the costs and make the case that, at times, hospice care remains the best care even when costs increase? - Is there a different program that would be better suited to care for patients with dementia or other non-cancer diagnoses that offers similar benefit without the same daily cost of hospice? For now, we’ll keep taking care of patients with the programs that best suit their needs and continue to work to prove that it is the right thing to do. 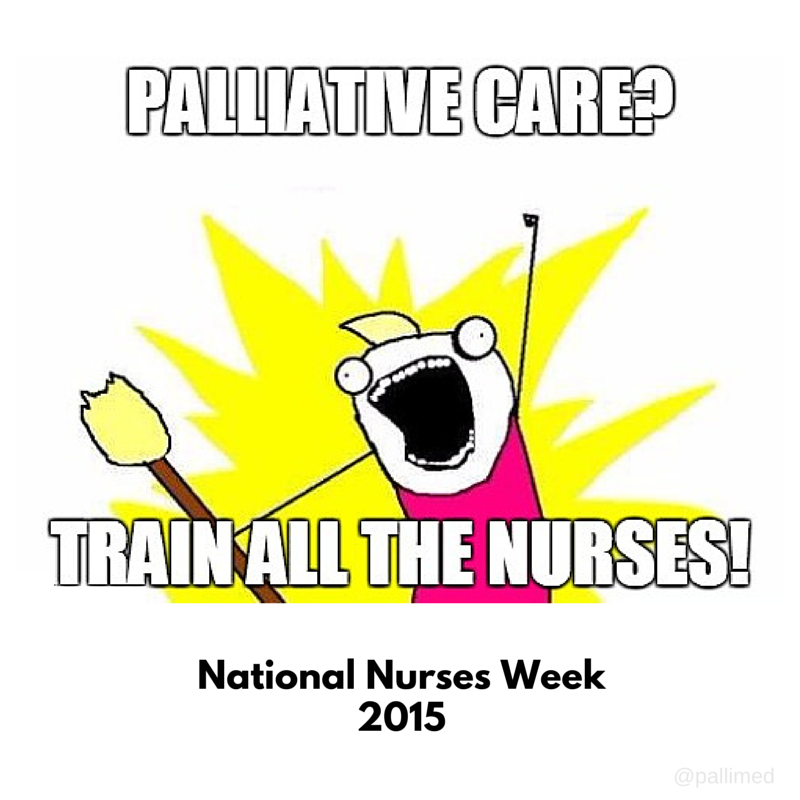 In recognition of National Nurses Week and the 2.8 million RNs and 690,000 LPNs in the US, I want to call your attention to the potential for nurses to lead in improving palliative care by implementing the recommendations of the IOM Report on Dying in America. Nurses are an essential element of the healthcare team, at the forefront in caring for patients at all stages of health and illness, and in all settings of care. Nurses are often the healthcare team members who know the patient best, caring for patients’ most intimate needs, supporting and listening when they are most vulnerable. Teaching the family members what’s happening to their loved one. Nurses spend significant amounts of time with patients: 8-12 hours per shift in the hospital, often multiple days in a row. In the outpatient settings, nurses work with patients over months or years in the clinic, in the home, over the phone, or online. 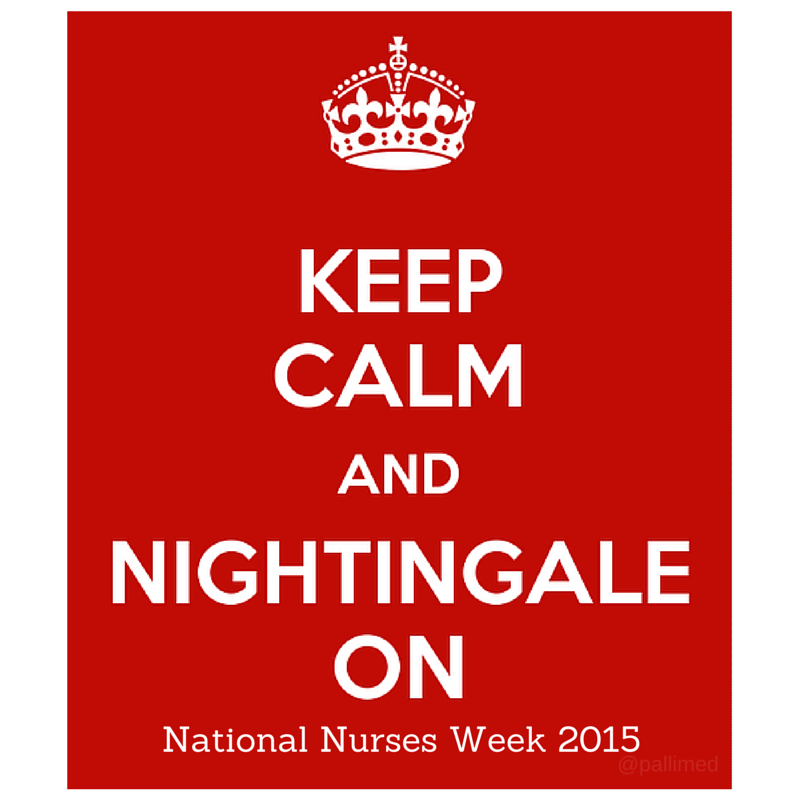 Nursing is the most trusted profession. So many patients or family members confide in us, telling us things that could make their quality of life or healthcare experience better, or more effective. Many of us have experienced our own end-of-life journeys, caring and advocating for our loved ones. Therefore, we are motivated to advocate for our patients and distressed when we see the patient and family suffer, especially when we tried to help, but failed. 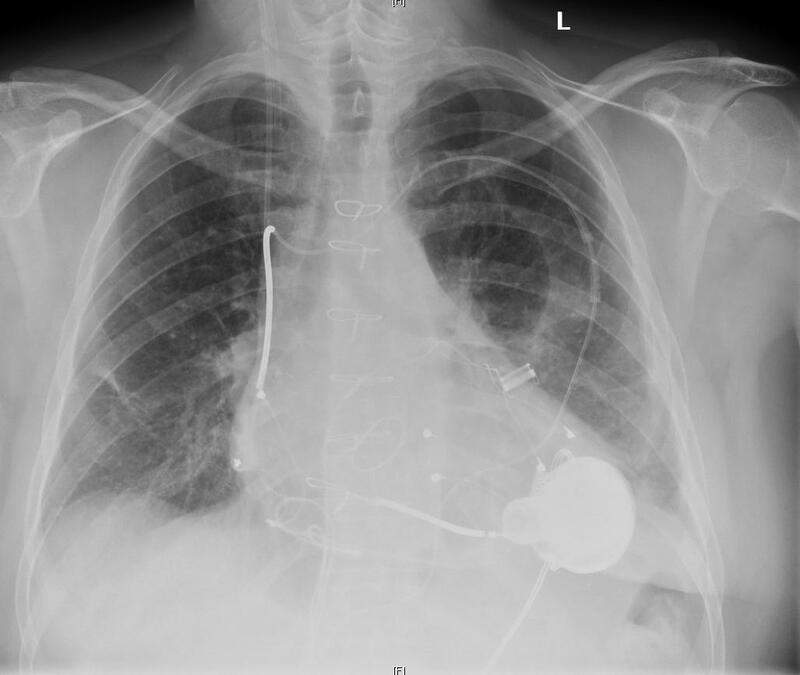 A 20-year-old is hospitalized for advanced heart failure, in CCU on a dobutamine drip. The VAD (ventricular assist device) /transplant team is working him up for VAD as a bridge to transplant. However, the heart failure (HF) nurses working with him in clinic express concerns that he is consistently missing medications and appointments, is binge drinking most weekends, and he will not let anybody help him with his healthcare needs. All are contraindications to VAD candidacy. However, the medical team proceeds with implantation, as they can’t say no with such a young patient. The patient dies 2 months later from septic shock caused by a drive line infection, leaving the HF nursing team with a feeling of overwhelming moral distress. A heart failure clinic nurse has worked with an 84-year-old patient for 3 years. Over the past 6 months she has seen increasing frailty, functional decline, frequent hospitalizations, diuretic resistance and intolerance to ACE inhibitors. She knows his prognosis is poor and wants to talk with the patient and his daughter about the option of DNR status and hospice, but she does not believe it is her role. However, when she talks with his cardiologist about her concerns and her recommendations, he won’t talk with them. The nurse is afraid of angering the cardiologist, so she does not push it. Her moral distress over the situation becomes more pronounced. One night the patient’s breathing suddenly becomes much worse and the daughter calls 911. He ends up in CCU. Three hours after admission, the patient goes into ventricular fibrillation. With CPR and ACLS he is resuscitated twice in 45 minutes. The intensivist calls the daughter, and gets a DNR order over the phone. While she is driving to the hospital, her father codes again, dying before she arrives. Quality care for those with chronic and serious illness is within our reach if we leverage the expertise and numbers in nursing, and consider the changes needed, based on the IOM report on Dying in America in light of these recommendations about what nursing can and should be. How can we remove these barriers and empower nurses to lead in promoting healthcare change and widespread access to palliative care for all who need it? We need to leverage the power of nursing to fully realize the possibilities of providing quality palliative care for all patients and their families. Join us on Twitter Wednesday night at 9p ET/6p PT to discuss these important issues with host Beth Fahlberg. Use the hashtag #hpm. *details are fictional and do not represent actual cases. They are based on a composite of experiences. Beth Budinger Fahlberg PhD, RN, CHPN is a clinical professor at the University of Wisconsin-Madison School of Nursing. She is a nursing educator, researcher and author interested in palliative care in heart failure and evidence-based innovative teaching and learning approaches. You can find her on Twitter at @bethfahlberg. First reported by Modern Healthcare, CMS (Medicare) has proposed a 1.3% rate increase for hospice organizations for FY 2016, which is a just under the 1.4% increase for FY 2015. This comes from a un-published proposed rule that also has some other provisions including clarification on diagnosis reporting, and a review of data that may inform hospice payment reform based on increased service intensity in the last seven days of a beneficiary's life. The official release date is May 5th, with a 60 day comment period to follow. There are some really insightful charts and graphs in this report to look at diagnosis, cost and use patterns. For example, this one on Medicare daily costs in the 180 days prior to hospice admissions vs the length of stay on hospice. Many in the field recognize that people recently on hemodialysis may get hospice very late, and that people with dementia are on hospice longer. But from a systems standpoint, I never thought about how CMS may see these pre/post-hospice costs. I drew an extra red line on the graph to approximate the daily hospice reimbursement rate of $153 (FY 2013). So looking briefly at this graph, one may make an argument that hospice care may be (slightly) more expensive than traditional medical care at the end of life. Important to understand if this is how CMS and policy makers are looking at it. We welcome discussion here about what you see as good and bad about this proposed rule and hope to have further analysis of the document as we get time to review it (volunteers needed). In addition, we hope that you fulfill your role as hospice and palliative care advocates and submit a comment* to CMS on this proposed rule; even if it is as simple as "Continue support for the Medicare Hospice Benefit!" But we know you are more creative and passionate and will come up with something much more substantial! *comments are not yet open since the rule is not officially published. But no worries, we will remind you when it is time along with highlighting a few of the areas you may be most interested in.